More precious than the gold that represents them, children are our future. The Gold Hope Project provides portrait sessions to pediatric cancer patients and raises awareness to this disease. 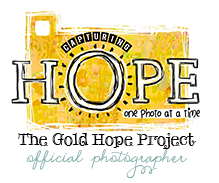 The Gold Hope Project is a group of photographers that have come together to capture the moments that these families holds so dear to their heart. Some of us have been touched by the presence of cancer, and some have not, but we have all been given a gift that we would like to share. Any child (infant - 21 years old) diagnosed with cancer of any form. No matter the prognosis the fight is still waged and we support you, this includes those that have won their battle with cancer. Each fighter will receive a customized gold session yielding at least 10 complimentary digital images, and their story will be showcased on the site and fan page.